Villa Capra, also known as the Villa Rotunda or simply "La Rotunda" as they call it in Italian, is an amazing building, designed by the great master Andrea Palladio. Villa Capra is a work of Renaissance architecture at the highest level. It is located in northeastern Italy, next to city Vicenza. Villa Rotunda bears the original name of -Villa Almerico-Capra, but today is known only as Almerico Villa, Villa La Rotunda and Rotunda. Like other buildings in Vincenza, built by Palladio, the Villa Capra is listed as a World Heritage Site by UNESCO. The name "Capri" comes from the Capra brothers, who finished the building after it was left of in 1591. When in 1565 the priest Paolo Almerico withdrew from the Vatican as an apostle of Pope Pius IV, and then Pius V, he decided to return to his hometown of Vicenza in the Venetian countryside and build a beautiful home. Alemerico hardly knew then, that this place, created by the architect Andrea Palladio would become one of the most inspiring and important architectural buildings for the next five hundred years or more. 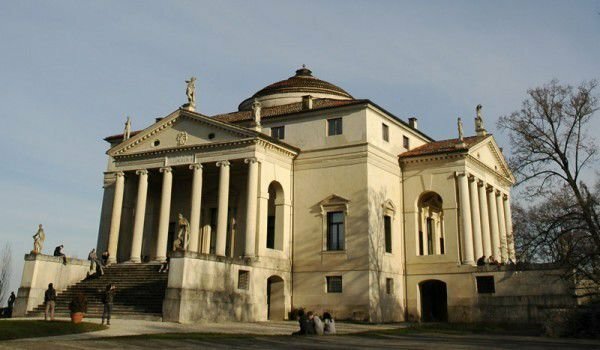 Villa Capra remains one of the best achievements of the architect Palladio. She later inspired the construction of many important historical buildings in Italy. But the truth is that Villa Rotunda has been modeled on the Pantheon in Rome. Villa Capra from the outset was planned to be no ordinary house, and in fact one of the most inspiring works of Palladio. He himself qualified it more as a palace than a villa or house. The basis of Villa Capra were laid in 1566, it has a fully symmetrical architectural plan - with four equal sides, each of which is made with an anteroom leading to one of the four doors. They in turn lead to a circular domed central hall. This room, like all other rooms and halls in the Villa Capra was made with mathematical precision, which is something like a trademark for the architect Palladio. Villa Rotunda is an excellent example of Renaissance architecture. Each gate is crowned with pediments and beautiful statues of classical deities, and each pediment is supported by six Ionic columns. Each entrance was made with one single window. In fact, the determination as to the rotunda, or Villa Rotunda is not correct because there is no Capra round base, but rather rectangular with a truncated cross. Unfortunately Palladio fails to see the Villa Capra finished because he died in 1580 and ultimately the building is finished entirely in the original plan of the architect. Assistant Palladio - Scamozzi, became chief observer after the death of the great master, and instead of making a large dome in the middle room, he decided to shrink the size of the room. The interior of the Villa Capra was designed as an impressive and even more beautiful facade. Everywhere inside can be seen beautiful murals, created by Alessandro and Giambattista Maganza, and by Anselmo Canera. In the Baroque, the building has four main rooms, most rooms are located on the second floor. In the eastern room of the Villa Capra can be seen an allegorical story about the life of the first owner of the villa.